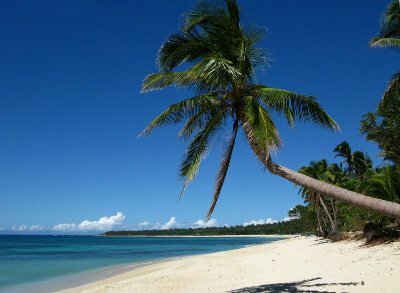 Ilocos Norte Province tends to have more wind than many other provinces due to its location between the South China Sea and the Pacific Ocean. They get regular and fresh North Westerly winds that make it a great location for wind energy generation. 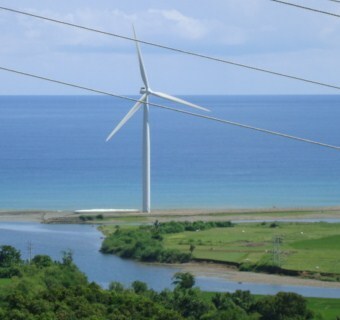 The wind farm project was started with an aid grant of $48 million dollars from the by the Danish Government to Ilocos Norte Province in 1998. 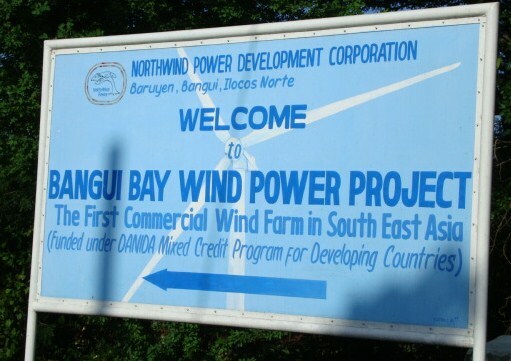 The The Bangui Windmills wind farm is recognized as the largest in Southeast Asia and sells power Ilocos Norte Electric Cooperative (INEC). The expected life span of the wind generation equipment is 21 years. The Northwind Bangui Bay Project estimates that 56,788 tons of CO2e (tons of carbon dioxide equivalent) of greenhouse gases will be reduced per year for the duration of the project activity. That’s 1.2 million tons of CO2! This gives Ilocos Norte when combined with hydro-electric power generation, one of the lowest carbon emission footprints in Asia and certainly within developed or developing countries. The towers are an impressive 60 meters high and are located just 10 meters from the sea edge. Each wind turbine is capable of producing electricity up to a maximum capacity of 1.65MW. 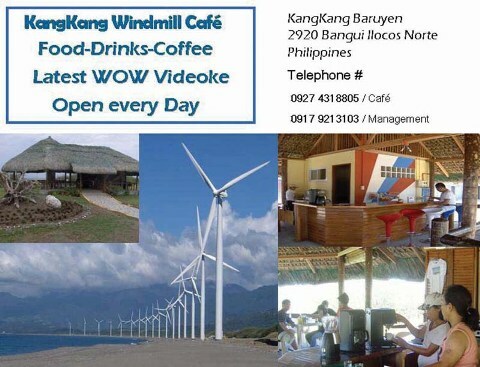 You can also visit and look at the windmills and have a cold drink or hot coffee at the Kang Kang café there and be hypnotized as the graceful blades slowly rotate.